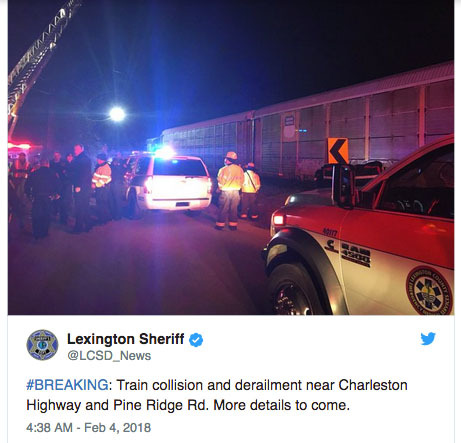 Amtrak train number 91, operating between New York and Miami, has collided with a CSX freight train around 2:35 am in Cayce, South Carolina, reports NBC. “At least two dead, 70 injured,” NBC stated. “The lead engine derailed, as well as some passenger cars. There were 8 crew members, and approximately 139 passengers, with injuries reported. Local authorities are on the scene responding”, reports Kurt Chirbas of NBC. Individuals with questions regarding passengers on train 91 can contact Amtrak at 1.800.523.9101, as posted by Amtrak. A few days ago there was another crash of a fatal Amtrak crash with a garbage truck outside Charlottesville, Virginia. See report here.